Upon your arrival at Zhangjiajie Hehua Airport, you are picked up to your hotel. Balance of the day is at leisure. Morning drive to Yongshun county to explore Furong Town. It is home to Tujia ethnic group with a history of over 2,000 years. The town is well-preserved black flagstone roads and historical living buildings (commonly known as Diao Jiaolou, which is a traditional living building style in some ethnic groups, such as Miao, Tujia, and Zhuang etc. Most of the buildings are built by moutains with a shape of one sitting tiger.). The town is the best place to learn the interesting facts of Tujia history and culture. 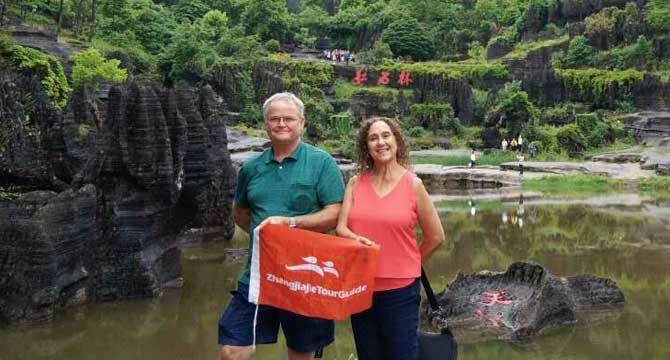 Afternoon transfer to Guzhang county to explore the Red Stone Forest National Geopark. This first red carbonate-rock stone forest national geopark of China can be dated back to the Ordovician Period of 480 million years ago. The park boasts of its deep caves and miles of red carbonate-rock stones whose color changes with the weather, purplish red in sunny days and brownish red in rainy days. Folk customs and arts such as original ecological dances "Maogusi" and "hand-waving" are included in the intangible cultural heritage of state level, further adding luster to the park. This morning take the cable car up to the Yellow Stone Village (Huangshizhai Village) to have 2-hour hiking on the mountain. After lunch at a local Chinese restaurant, enjoy a 2.5-hour leisure walking along the Golden Whip Stream, where is most likely to bring you into the Pandora's wonderland of the movie Avatar. Another full day to explore the beautiful Zhangjiajie National Forest Park, you will ascend the Yuanjiajie Scenic Area by the Bailong Elevator - a glass elevator built into the side of the mountain. On the summit, you will take about 2.5 hours to walk to discover the Pillar of the Southern Sky. It was used to inspiration for the famous "Hallelujah Mountains" seen in the Blockbuster movie, Avatar. Proceed to the platform of Forgetfulness to enjoy the nearby peak views and then walk across the No. 1 Bridge under Heaven. Then move to enjoy the breathtaking view in Yangjiajie Scenic Area. After lunch, move to see the Tianzi Mountain. Later, take the cable car down the mountain and go on sightseeing along the dreamlike fairyland – Ten-mile Natural Gallery (sightseeing train optional). Morning hike about 1 hour through a grand valley (Baizhangxia) to see the beautiful Baofeng Lake. After a short cruise on the lake, move to explore the Tianmen Mountain National Forest Park, where you will experience a ride on the world's longest cable car up to the summit of the Tianmen Mountain, taking in the spectacular scenery as you do so. Once at the summit take a hike (approximately 2 hours) on the plank road alongside the Guigu Cliffs. During the hiking, you can choose to experience the glass skywalk built along a cliff with an extra expense (RMB5/pp). After the hiking, you will pay a visit to the Tiammen Temple and take the Forest Sightseeing cable car and back to the Tianmen Mountain cable car station and take the big cable car up to the middle station. Later, take a bus along the Tongtian Avenue (a famous mountain-winding highway in the world) to explore the Tianmen Cave. End the trip with a transfer to the airport.